In order to understand what is a blackhead is you must first know what a comedo is. A comedo is a clogged hair pore in the skin, but sometimes dirt or debris on the skin forms these pores. Adults commonly face this problem, especially those with oily skin. 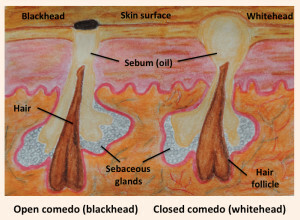 A comedo is distinguished in two types: Whitehead (open) or Blackhead (closed by skin). Comedones can form with or without the presence of acne. 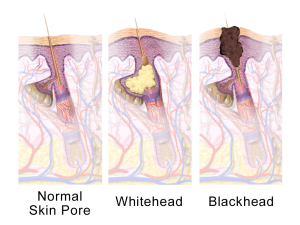 Whiteheads or blackheads mainly occur on the nose and face, but some people suffer from them in other places such as the ears, the back or shoulders. Comedo or Comedone will give birth to a blackhead or a whitehead; however, blackheads are nothing but bumps that appear on your skin when dirt gets clogged in the pores (holes). Whitehead and blackheads can form anywhere there is a hair pore. Blackheads can be classified as first stage acne before the bacteria enters the clogged pores. Blackheads occur due to excessive sedum (oil) when produced at the base of the hair. Blackheads or whiteheads may be yellow in color for some people. Sometimes comedones will turn into a pimple. They grow if you do not maintain proper treatment. Studies have shown hormonal changes cause blackheads. As the estrogen level drops in the female body it causes oil glands to increase production, which heightens the probability of clogged pores and blackheads. Intense workout sessions, record-breaking heat waves, and anything else that gets your perspiration going can lead to the formation of blackheads. Stress is also considered a major factor in the development of blackheads, yet the link between stress and blackheads has not been determined yet. Dirt prevailing on the skin is likely to fill the skin pores, which ultimately leads to the developments of a blackhead. Makeup and skin products with artificial colors or fragrances can also clog the hair pores on your nose causing blackheads to form. If you like this article about what is a blackhead do check out How To Remove Deep Blackheads.